These Easy Meals For A Large Family are all about simple ingredients and minimal processes. Delicious meals that slow cook for you, or only require a little work but are hearty and family friendly are key. We love using foods that are inexpensive and creating a delicious gourmet meal, but sometimes you need that meal to be just a bit quicker to get on the table. From casseroles to Crockpot meals this list includes some of the best recipes around. 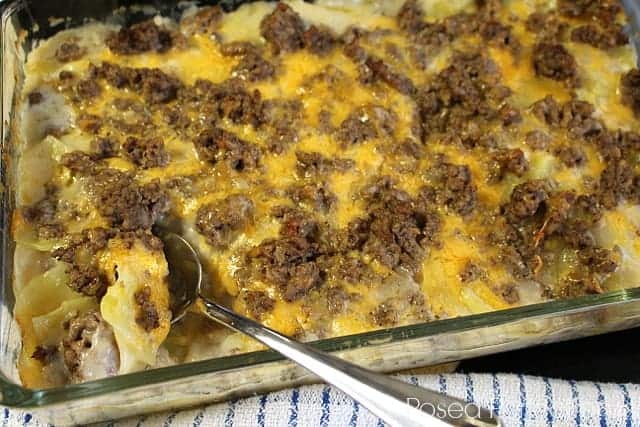 Posed Perfection is always sharing simple and yummy recipes, and this Hamburger Potato Casserole is no exception. This starts with just a handful of basic ingredients you probably always have in your kitchen. Layered potatoes with seasoned ground beef, onions and cheese make this a hearty one dish recipe everyone will love. It is quick and easy to assemble, and doesn’t take long to heat through in the oven. 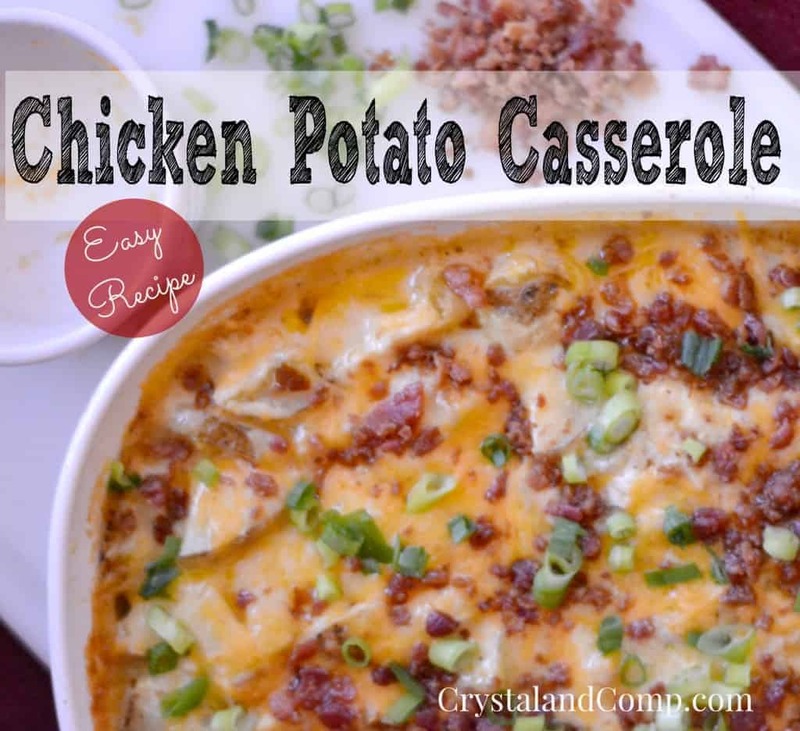 If chicken is more your style, this Easy Chicken And Potato Casserole from Crystal & Company is sure to make your mouth water. This is chock full of cheese, bacon, onion and of course potatoes with chicken. It is hearty, warm from the oven deliciousness that will make your kids beg to have it on a weekly basis. 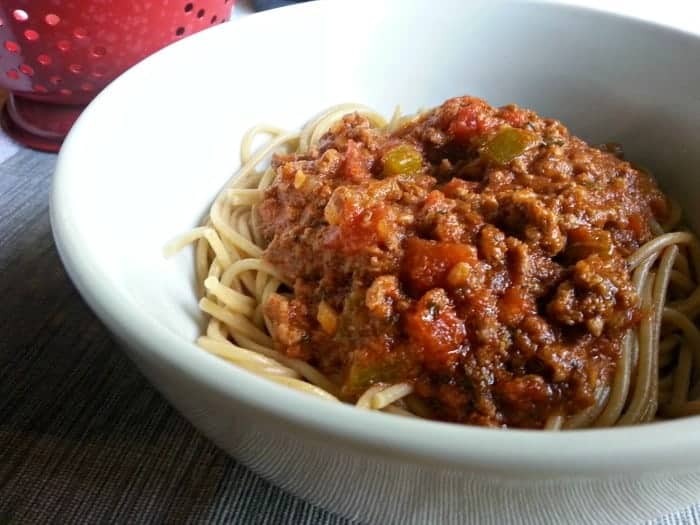 This Hearty Homemade Spaghetti Sauce from You Brew My Tea is a semi-homemade sauce that simmers slowly in a Crockpot or on the stove Add to any pasta you prefer, or use meatballs instead of ground meat to create meatball sub sandwiches. This is one recipe everyone in the house will be asking for over and over again. This Easy Mexican Mac & Cheese recipe from I Love My Disorganized Life is sure to please both you and your kids. Using a semi-homemade recipe like this where boxed ingredients get a makeover is a great way to pump up flavor while giving yourself a break in the kitchen. Everyone loves mac and cheese, but this recipe really pumps up he flavor and makes it a whole meal! DIY Budget Girls’ One Pot Chili Mac & Cheese is seriously delicious and a favorite of teenagers. It’s easy and tasty just like you need it to be. Serve with some salad on the side, or amp it up with chunky veggies mixed in. 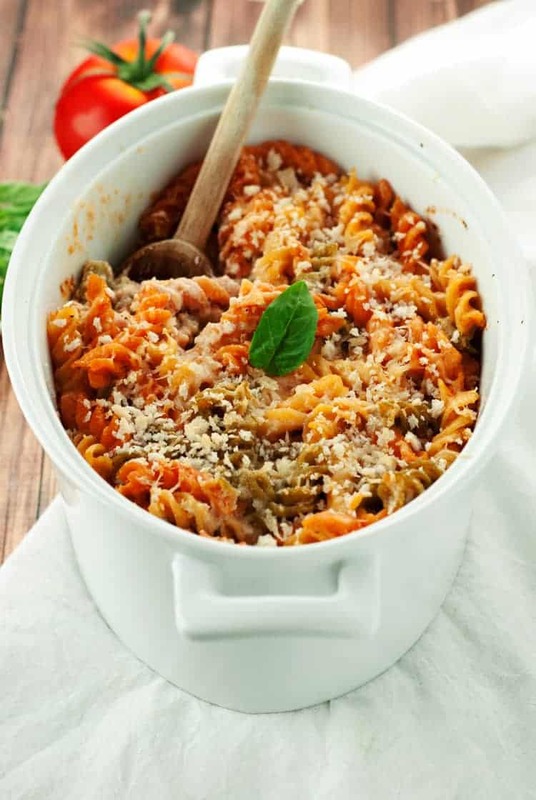 This Easy Pasta Bake from A Simple Pantry is just what you want to have on hand to feed a large family. 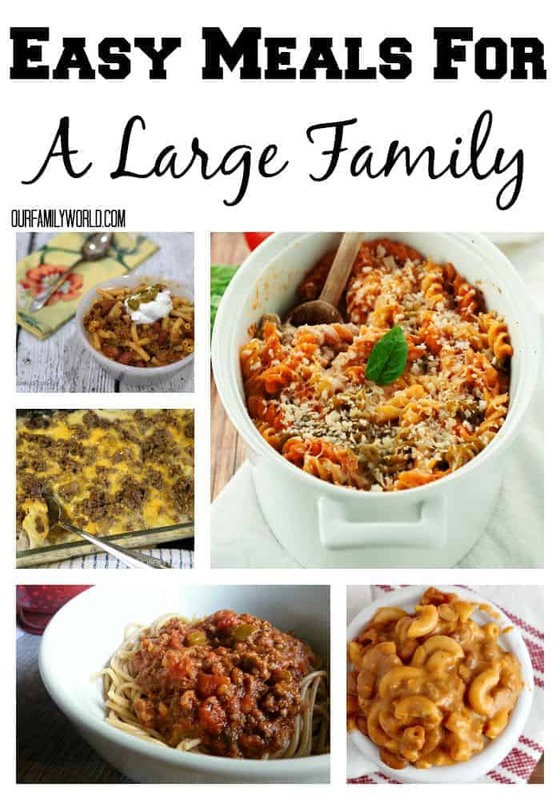 Pasta, vegetables, sauce and cheese are easily thrown together and popped into the oven for one of the best classic easy meals for large families you can make. Serve with a side salad or some crusty bread and everyone will be raving. These easy meals for large families are favorites in our house. Enjoy these in one meal batches, or double the recipes and freeze for use on nights you are too busy to cook. Do you have any favorite easy meals for large families? Share in the comments! 13 Ways to Have the Most Amazing Mermaid Party Ever + a Crazy Cute Mermaid Cupcake Recipe! I’d like more than a second to decide if your site is worth revealing my email address. Thanks. Also, there’s more to cooking for a family than imitating Chef Boyardee and Hamburger Helper. This looks delicious! Will have to try these recipes!! We are a big family, this is fanatstic I’m sure my family would live this. Thanka for sharing us your smart idea. Awesome and tasty looking dishes. Great recipes. I’d love to try the potato one and replace with cauliflower! Thanks for the great ideas. These are great dinner ideas for a large family. I grow up in a large family and we used to eat a lot of spaghetti but we are italian too. lol. The chili is an easy one to make with a large family too. Thanks for sharing. These are great recipes. Bookmarking them for later! I love it when dinner is easy to make. Thanks for the excellent recipes! These look great. Even though we have a semi-big family, the kids don’t eat too much yet. However, I love leftovers, so these will be great. I love pasta, especially if it’s baked with cheese and marinara. These are yummy ideas, something to cook even if you don’t have a large family. I have a large family, will try some you shared. Thank you. I’m such a casserole person, so I really am loving these ideas. I want each and every one. Great ideas. always on the look out for new recipes. My son can’t do dairy, but these have given me some great ideas! All of it looks wonderful. Made me hungry right now!! I am going to reduce these quantities and make some of these dishes for myself!!! Perfect timing! That classic meat sauce looks perfect! Ideas! I’m all about casseroles, especially when the weather starts to get colder! I know making meals for a large family can be a challenge. I’m over that now, and my issue making meals for ONE. haha!! Congratulations on some terrific family ideas. You get 5 star from me. looks good chicken potatoes and recipes is doable. These are awesome! I’m pinning them now 🙂 Thanks! These easy meals look great for a large family. Thanks for sharing! I love easy meal ideas like these. I will try a few for sure. Katie, all these looks so good! Thank you for these ideas and recipes. I will definitely be adding this to my menu list :).